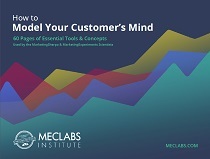 SUMMARY: We recently published data about how customers want to communicate with companies. 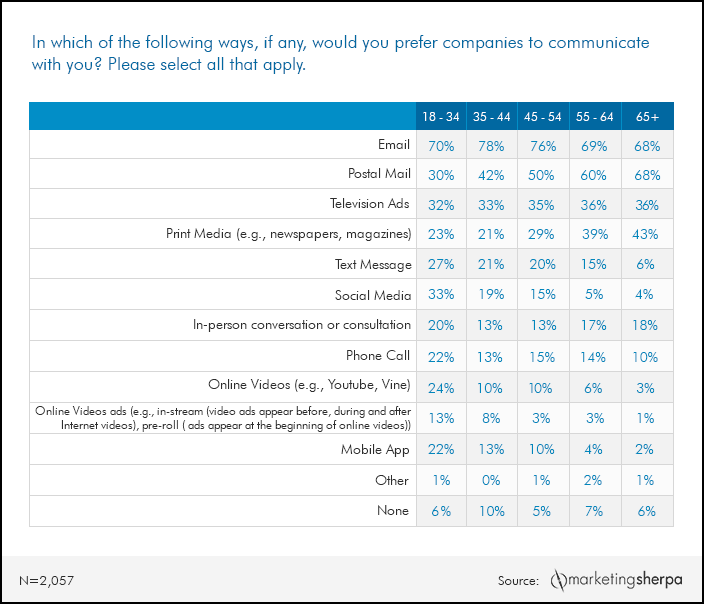 A MarketingSherpa reader wrote in to ask for empirical data showing how different age groups and generations prefer to communicate with companies. 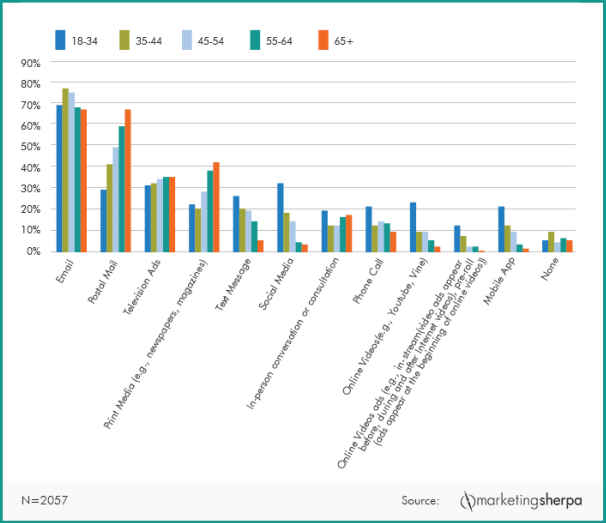 In this Chart of the Week article, we take a deeper dive into the data to discover how age affects channel preference. Q. In which of the following ways, if any, would you prefer companies to communicate with you? Please select all that apply. When we label, sometimes we divide. The conventional wisdom is that these different generations are vastly different in how they interact with technology. However, according to our recent research of 2,057 U.S. adults, these different age groups are more alike than we may have thought when it came to one form of digital communication — all age groups said that email was their preferred means of communications with companies. Also, while people 65 and over list email as their preferred means of communication, it was tied with postal mail for the top spot (both 68%). Postal mail was the communication medium that showed the biggest differentiation between age groups. As I said, 68% of Americans 65 or over prefer postal mail (tied for the top spot in that age group), but there was a dramatic drop off among younger people with only 30% of those 18 to 34 preferring postal mail. Note: In response to a reader question, below is the data from the chart in table form.